The total opposite can also occur. You may shoot a 1 ¼” group and turn around and follow it with a ½” group without changing anything. If you only shot the one group, you might decide that load wasn’t any good and move on to something else without really knowing what that load was capable of. I would suggest shooting a minimum of 3 five shot groups and averaging the group sizes before deciding if the load is acceptable or not. Obviously the more rounds you shoot for a group and the more groups that you shoot, you will get a much better representation of what that particular combination is capable of. In most cases, I feel that 3 to 5, five shot groups will give you a pretty good representation of how a load will perform in that specific firearm. This entry was posted in Competitive Shooting and tagged bullet flyers, firarms, flyers, group sizes. Bookmark the permalink. 6 Responses to What’s Up With Those Pesky Flyers? I am always amazed by the people shooting 3 shot groups, then claiming they have found the “one”. Maybe they have, more likely they have not! I agree, my group sizes have change alot from the first 5 shot group to the 3rd 5 shot group while testing loads. 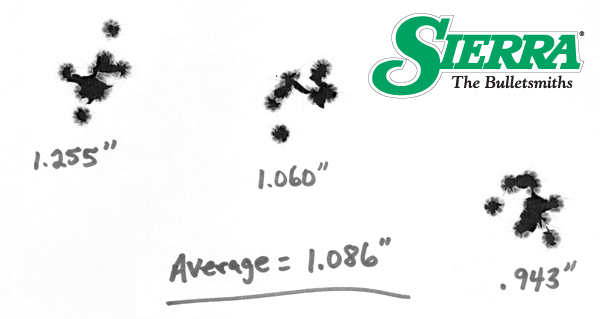 I have had 3 shot change from .3″ to a real 1.5 when the same load was tested with 5 shot groups. 3 shot groups are meaning less, 5 shot groups are not much of a step up. 10 shot groups are the true “gold” standard. If you take the time to do your 5, five shot groups but “index” the target on top of a backing target then take a look at how much bigger the group is on the target backer and compare with the 5 shot groups. Great suggestions! It always kills me to see the single 3 and 5 shot groups as well. I would also like to add the necessity of doing these group exercises at different ranges to confirm that a 1/2 MOA load at 100 isn’t a 2 MOA load at 300, or 600. Personally I shoot 3 five shot groups at 100, 300, and 600 before choosing a load. You may shoot the lights out at 100yrds with a 168gr .308, but due to your barrels twist rate the bullet that originally didn’t do as well might do twice as good at longer distances. Seriously, too many people do not understand what happens at longer ranges to the bullet they put down range. Some times it is good, some times it is bad or really bad! Another thing over look by people; just how far are you going to realistically going to shoot with a particular round/firearm combination? If one is using a shorter range combination, does not matter how well it does at 600. However the opposite is also true. Those whom only test a long range shooter at 100 or maybe 200 yards, but are willing to take a much longer shot have only done half the work they need to do.